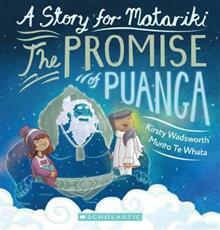 "There is a bright new star in the winter sky -- Puanga, cousin to the Matariki sisters. Each year, she appears to the people of Aotearoa, a special sign (for those unable to see Matariki) that winter and the Mori new year are coming. With themes of friendship, family, Mori tradi... read full description below. There is a bright new star in the winter sky-Puanga, cousin to the Matariki sisters. Each year, she appears to the people of Aotearoa, a special sign for those unable to see Matariki, that winter and the Maori new year are coming. A new addition to Scholastic's popular Matariki range, this time introducing readers to the Puanga star, which is celebrated for Maori New Year and the coming of winter in place of Matariki along parts of the West Coast of New Zealand.